Super crispy roasted potatoes that are perfect every time with NO flipping or fussing! The only way I make roasted potatoes! I’m just a potato kind of girl. My parents were potato kind of people so I guess that’s where I get it. I know in 2014 I’m supposed to be swapping white potatoes for sweet potatoes, or quinoa, or bulgur, or lentils, but this girl just isn’t there yet. I’ll have you know, aside from the bulgur, I have cooked and eaten each one of those things more than willingly. But sometimes there’s nothing that can replace a potato roasting in a pan of butter and your favorite seasonings until golden and crisp. 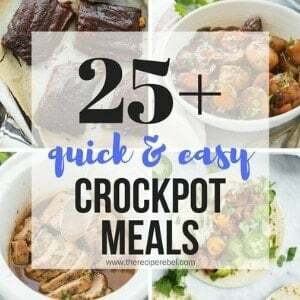 This is another recipe that found me early on in my Pinterest days. Speaking of the early days, I can remember scoffing at Pinterest addicts, thinking the whole idea was kind of ridiculous. It was only when one of my sister’s showed me the things she had found on Pinterest that I had asked her for an invite (but I mean, how lame in the first place that someone has to seek out an invitation?). It wasn’t long before it was a full-blown addiction. It was on Pinterest that I discovered food blogging was a Real Thing. 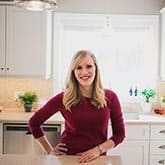 Almost 2 years have passed since I joined and I have tried more than 525 recipes. And some of those I have made more than once. This is one of those recipes. Though this recipe, for me, is more about the method than the ingredients. 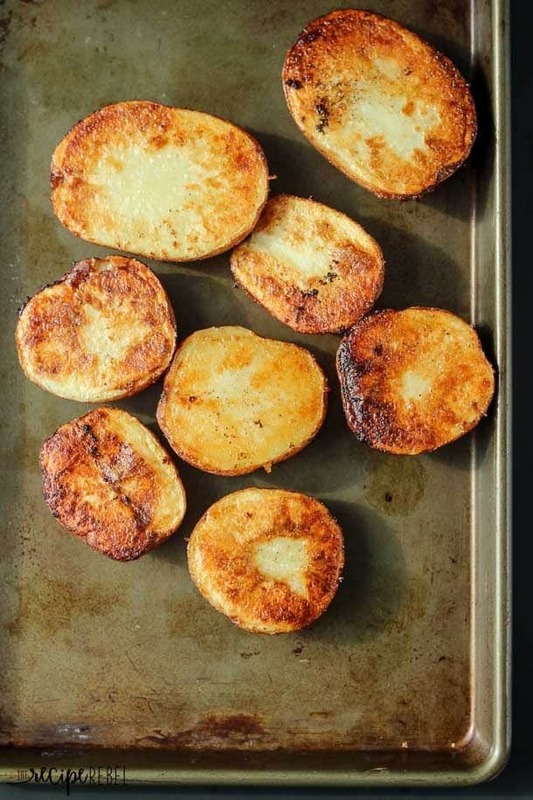 I remember before finding this recipe (and Pinterest) how I would cut my potatoes into little cubes, season them with a bit of butter and some herbs and salt, toss them in a pan and put them in the oven. I would stir them every 10-15 minutes or so, hoping they wouldn’t stick and they would anyway. In the process of stirring them 4 or 5 times during their time in the oven they would fall apart and become somewhat mushy instead of the crispy potatoes I dreamed of. These potatoes are no-fail. 3 (or more if you want) ingredients, no flipping, no stirring, no mushy potatoes. Delicious. 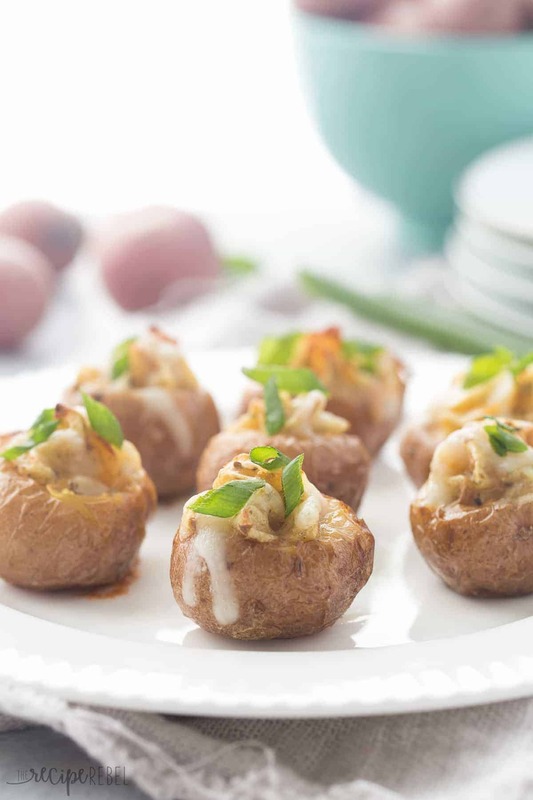 You might also like these mini Twice Baked Potatoes! 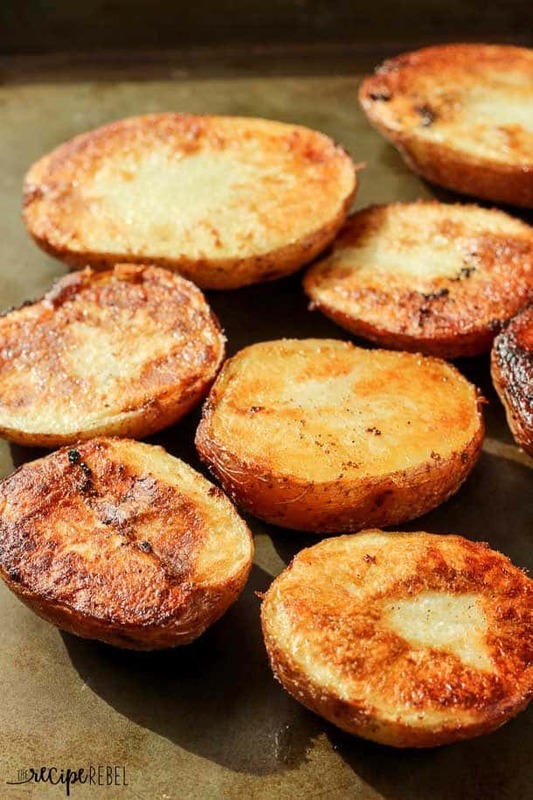 No-Fail Roasted Potatoes -- deliciously crispy and golden! Preheat oven to 400 degrees F. While oven is preheating, place ¼ cup of butter on a large pan or cookie sheet (as long as it has sides). Place in the oven to allow the butter to melt. When the butter is melted, remove pan from the oven and sprinkle your seasonings over the butter. When I'm in a hurry, I will just do seasoning salt, but you can do whatever your family enjoys. Place potatoes cut side down on the butter. Using a pastry brush, brush some of the excess butter onto the backs of the potatoes so they get crispy and flavorful as well. Bake 30-40 minutes, depending on the size of your potatoes. You can always check the doneness of a potato but poking it with a sharp knife. If the knife comes out easily without resistance, your potatoes are done. Cool for a full 5 minutes before removing from the pan. No-Fail Roasted Potatoes — deliciously crispy and golden! Preheat oven to 400 degrees F. While oven is preheating, place 1/4 cup of butter on a large pan or cookie sheet (as long as it has sides). Place in the oven to allow the butter to melt. When the butter is melted, remove pan from the oven and sprinkle your seasonings over the butter. When I’m in a hurry, I will just do seasoning salt, but you can do whatever your family enjoys. I followed the recipe exactly and these potatoes were amazing! 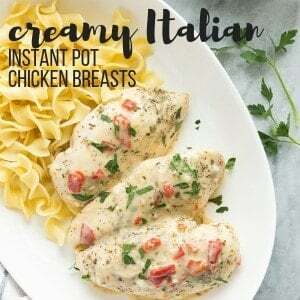 They smell and taste delicious and are soooo easy! This is the recipe I’ve been searching for. It’s the best and I’ve tried quite a few over the years!. Thank you so much for sharing. Thanks Lenna! We love it too! These potatoes are the best! The family loved them. I made them about a year ago & then somehow lost or deleted this recipe. So happy I found it again. I would like to try this recipe I’m just not sure what type of potato is best to use? Can you advise me? I love red potatoes because they are creamy and have a smooth skin, but you can use a yellow potato as well. Could you substitute butter for olive oil? Thanks! Great recipe. The family really enjoys it! Potato recipe for life now! SO GOOD! I wish I had found this years ago. These are seriously the best! Love, love,love the way themes turned out. Thanks for sharing. Thank you! So glad to hear that! 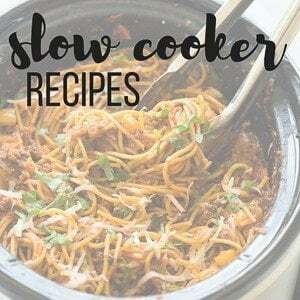 This recipe has been around for many years and always a winner. They were called Crisscross Potatoes. Take your no knife and make Crisscross pattern into the cut side of the potato about half way through, but don’t cut all the way through. Make it the same as your recipe with cut side down. It will brown all the cut edges and make it crispy, but creamy on the inside. Thanks for sharing! Can use sweet potatoes and adjust your seasonings to a little cinnamon and nutmeg to taste. Enjoy! I meant to say halfway down the whole potato. Sorry. 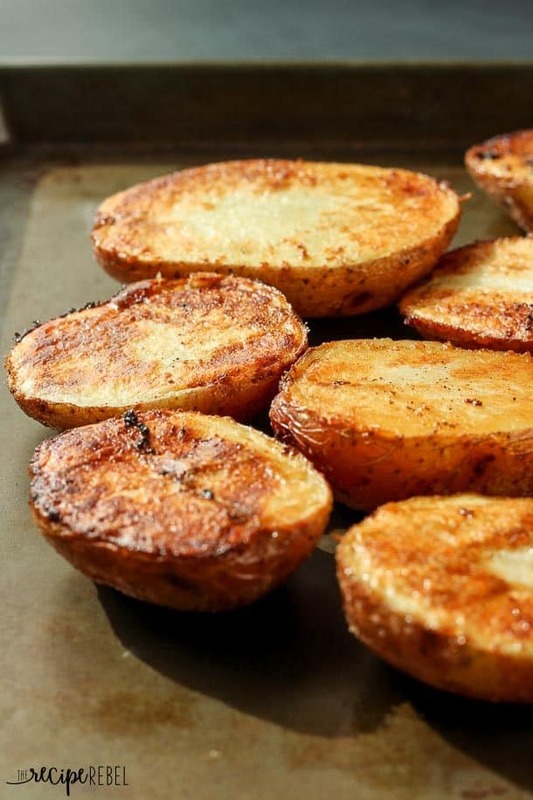 I just came across this recipe on Pinterest and I had to let you know; these potatoes are amazing! I have never been able to cook roast potatoes (they either end up undercooked or burnt) without resorting to using a microwave or boiling them. I could never be bothered but this recipe means I will be able to have them all the time! 😀 So yummy! Just made these and they are absolutely delicious. Thank you so much. I use Lawry’s, but you could easily find a recipe for it! I love potatoes too. This looks so yummy 🙂 I would love for you to share this on my Friday T.G.I.F. linky party 🙂 Have a great weekend! !